Kinetics of Aggregation and Gelation presents the proceedings of the International Topical Conference on Kinetics of Aggregation and Gelation held on April 2-4, 1984 in Athens, Georgia. The purpose of the conference was to bring together international experts from a wide variety of backgrounds who are studying phenomena inherently similar to the formation of large clusters by the union of many separate, small elements, to present and exchange ideas on new theories and results of experimental and computer simulations. This book is divided into 57 chapters, each of which represents an oral presentation that is part of a unified whole. 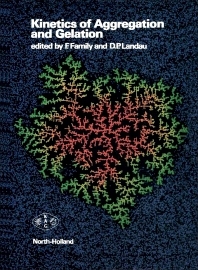 The book begins with a presentation on fractal concepts in aggregation and gelation, followed by presentations on topics such as aggregative fractals called ""squigs""; multi-particle fractal aggregation; theory of fractal growth processes; self-similar structures; and interface dynamics. Other chapters cover addition polymerization and related models; the kinetic gelation model; a new model of linear polymers; red cell aggregation kinetics; the Potts Model; aggregation of colloidal silica; the ballistic model of aggregation; stochastic dynamics simulation of particle aggregation; particle-cluster aggregation; kinetic clustering of clusters; computer simulations of domain growth; and perspectives in the kinetics of aggregation and gelation. This book will be of interest to practitioners in the fields of chemistry, theoretical physics, and materials engineering. Glassy Rigidification Phenomena: Is There a Unified Picture Emerging?